Shopify Competitors – What's the Best Shopify Alternative in 2017? Shopify Competitors – What’s the Best Shopify Alternative in 2017? Many Shopify competitors offer attractive alternatives for selling online, and some are even free. We looked at the most popular options and rising stars and selected six that suit the range of small business needs. Read on for our review of these Shopify alternatives as well as our top recommendations. Who is it best suited for? We also took into consideration the fact that some sellers prefer to sell using a blog platform, like WordPress, or want to turn an existing Wix or Weebly website into an online store. So we include Shopify competitors that support these platforms in our list. Read on to learn more about our top six Shopify alternatives. Who is Square’s Free Online Store best suited for? Square is ideal for small ecommerce sellers needing a simple, low-cost online store platform, or for retail stores who also want to sell online. A Square online store is our top Shopify alternative because it answers the online selling needs of all types of businesses, from ecommerce sellers to retail stores, and does it for free. Square’s modern, easy-to-build online store lets you list and sell an unlimited number of products, and you’ll never pay a monthly fee. In fact, the only thing you pay are credit card processing fees when you make a sale, and you’d pay this on any platform you use. Secure, PCI-compliant checkout Yes, checkout is fully secure on Square’s PCI-compliant servers, learn more here. Print shipping labels Yes, using ShipStation. 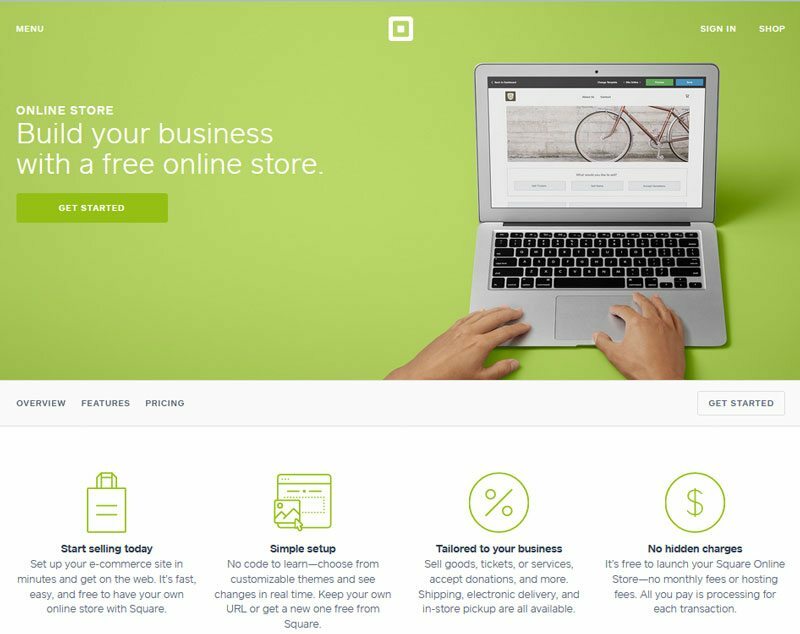 Why is Square’s Free Online Store a good Shopify alternative? First of all, it’s free in contrast to Shopify’s lowest plan price of $29/mo. Aside from the cost, Square’s online store is amazingly simple to set up and a breeze to run. It’s arguably even easier to launch than a Shopify store, which is saying a lot. Like Shopify, you can list an unlimited number of products in Square’s online store, and categorize items any way you wish. However, there is one major difference between the way a Square store and a Shopify store works. Square’s online store is a simple, one-page solution. In contrast, Shopify lets you create a full-featured multi-page online store, complete with numerous product categories and even a blog. But not everyone needs Shopify’s level of complexity to sell online. If that’s you, then Square’s online store probably delivers just what you need, for less. If you have a retail store and want to sell online too, Square is a top contender. Its all-in-one payment processing and sales tracking system ties online, mobile, and in-store sales together under one robust business management system. Plus you manage it all: orders, sales, customers, inventory, and even multiple store locations, from one convenient dashboard. It even connects seamlessly to ShipStation to print shipping labels for your orders. Like Square, Shopify also supports in-store point-of-sale and mobile-pay sales. But if you don’t need Shopify’s complex website, why pay the extra money when Square does it all for free? Does Square sound like the right Shopify alternative for you? If so, see how to set up your free Square online store here. Who is Ecwid best suited for? Online sellers who want to add ecommerce features to a WordPress site, or to websites on other platforms, like Wix or Weebly. Monthly fee Free up to 10 items, paid plans start at $15/mo. Credit card processing fees EcwidPay 2.75% + 30¢ per transaction or other payment processors available, see them here. Secure, PCI-compliant checkout Yes, checkout is fully secure on Ecwid’s PCI-compliant servers, learn more here. Number of product listings Based on plan level, learn more here. Print shipping labels Yes, using Ordoro, Shipping Easy, and ShipStation. Other key features An add-on store that works with virtually any web hosting platform including WordPress, Wix, Weebly, and many more. Why is Ecwid a good Shopify alternative? In a word: Choice. 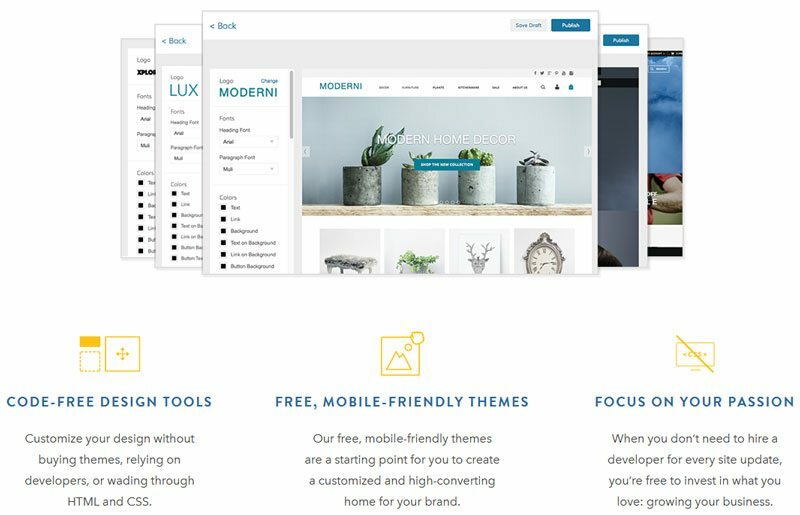 If you already have a website on WordPress, Wix, Weebly or any of these other platforms, Ecwid integrates to add a store to your existing website. This is a mighty nice alternative to rebuilding your website on Shopify and taking the risk of losing your links and search engine rankings if you’re not careful. 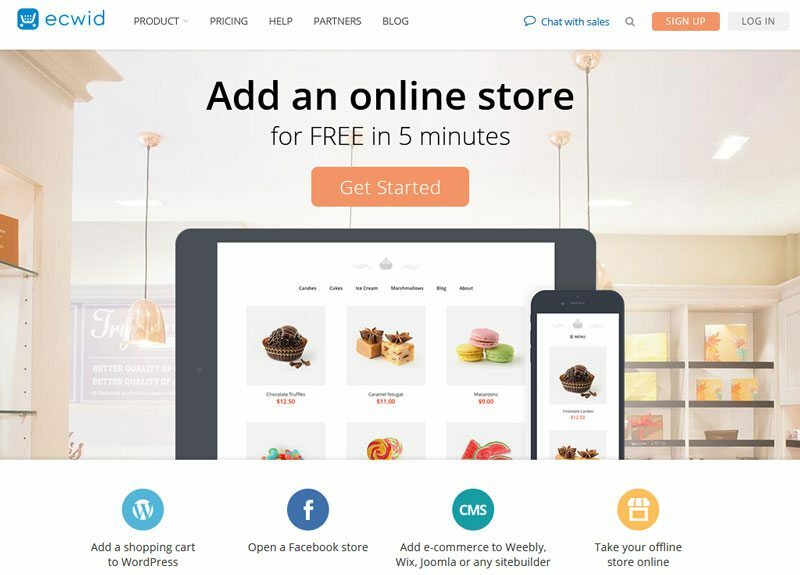 If you don’t already have a website and are shopping around for Shopify alternatives, Ecwid is worth a look for many reasons, and price tops the list. With paid plans starting at $15/mo. and topping out at $99/mo. for the unlimited plan, Ecwid is half the cost of Shopify. Plus, when it comes to store setup, product listings, order management, and marketing features, it matches anything Shopify can do. Last but not least, Ecwid is very multichannel-friendly. All plans support a Facebook Shop, but the real bonus is that you can add your store to multiple websites and manage everything from one central dashboard. For those managing several branded blogs or related websites, you can create a store on any or all of your sites with just a few clicks, and manage it all from one spot. Does Ecwid sound like the right Shopify alternative for you? If so, see how to set up an Ecwid store here. Who is BigCommerce best suited for? Growing ecommerce sellers and those with large inventories who want a Shopify alternative with advanced management and multichannel tools. Credit card processing fees Depends on your payment processor, learn more about credit card processing fees here. Secure, PCI-compliant checkout Integrates with a number of secure payment systems including PayPal, Stripe, and more here. Other key features Like Shopify, BigCommerce integrates with Amazon, Facebook, and Pinterest, but it also connects your products with eBay, which is harder to do with Shopify. Why is BigCommerce a good Shopify alternative? In ecommerce circles, BigCommerce is considered neck-and-neck with Shopify in overall features and costs. For most small online sellers, it’s really a toss-up which to use. BigCommerce is priced slightly less than Shopify on some plans, but when closely comparing store features, more differences pop up. Where BigCommerce pulls ahead is for stores that handle high volume in both sales and inventory tracking. BigCommerce has some really slick order, inventory control, and store management tools that beat Shopify for stores with higher-volume sales. High-volume means different things for each business, but if you handle 100+ orders per day and 1000+ unique items, BigCommerce can be more efficient than Shopify. Certainly Shopify can handle this level of seller and beyond, but the overall opinion is that BigCommerce is more streamlined for volume and multichannel sellers. For this reason, some fast-growing companies that start on Shopify ultimately move to BigCommerce to take advantage of their management features. Another plus that might matter to you, BigCommerce directly integrates with both Amazon and eBay, while Shopify currently only directly integrates with Amazon. Both support similar social selling, shipping, payment processor integrations, so you really have to dig into the details to find the differences. But, if you plan on growing into a handling large inventories and processing volume orders, BigCommerce may be the right choice for you. Does BigCommerce sound like the right Shopify alternative for you? If so, learn more here. Who is WooCommerce best suited for? WooCommerce is best for WordPress users who want to turn a WordPress blog into a full-featured online store. WooCommerce is a robust online sales tool that’s comparable to Shopify in every facet and feature, with one caveat: If you’re new to working with websites, you’ll have a learning curve. 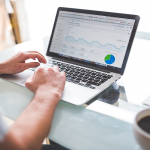 But if you have some familiarity with website dashboards or WordPress in particular, you should be able to launch an online store using WooCommerce on a WordPress site fairly quickly. However, if you’re a web newbie, Shopify is easier by comparison. Why is WooCommerce a good Shopify alternative? Features-wise, WooCommerce provides a ton of robust online selling tools that meet and even exceed those of Shopify. Plus, WooCommerce harnesses the power of the versatile WordPress blogging platform. If you know what you’re doing, you can turn a WooCommerce store into anything you wish. Destination site, review blog with product sales, a media site that sells ebooks and podcasts; you name it, WooCommerce and WordPress can do it. Using WordPress’s plugin-based platform, you can add all sorts of features to both your main site and your WooCommerce store pages. Many are free, but some do have costs attached. But WooCommerce’s base plugin delivers everything a small seller could want. Product listing options, numerous payment options, shipping integrations, inventory tracking, and much more. That said, with this much power and flexibility comes a learning curve. A web newbie would be hard-pressed to launch an online store in a day, or even a week, with WordPress and WooCommerce. However, a seasoned WordPress user would take right to it. If you have some time to invest, WooCommerce will let you grow an online store into anything imaginable, and cost you nothing more that your monthly WordPress hosting. 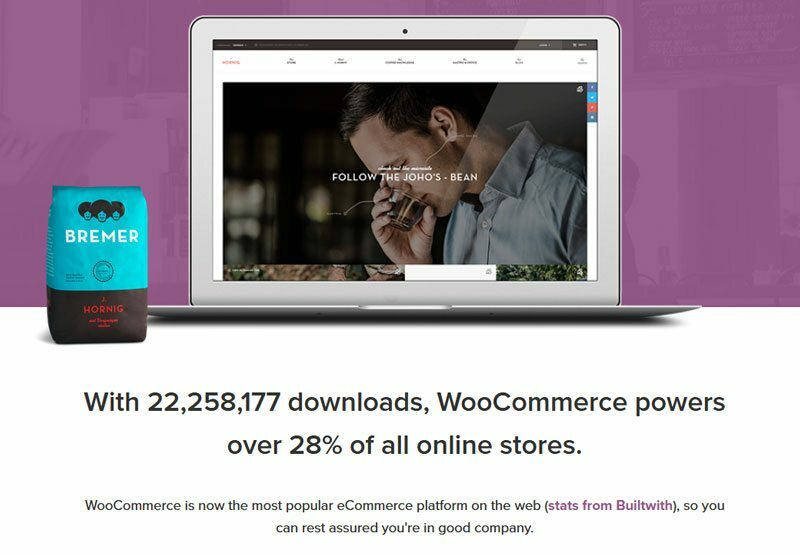 Does WooCommerce sound like the right Shopify alternative for you? If so, see how to get started with WordPress here, and how to sell on a WordPress site here. Who is Spreesy best suited for? 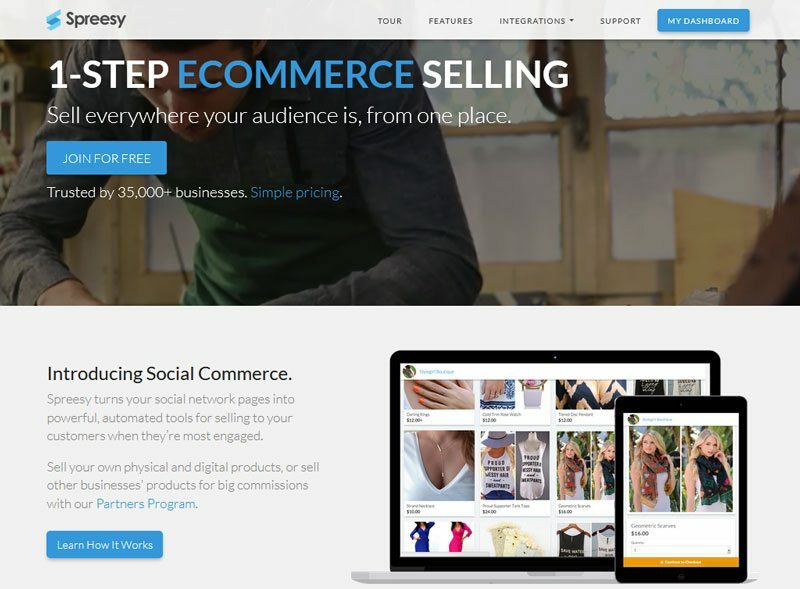 Spreesy is for online sellers who want to list and sell products directly on social sites like a Facebook Shop, Pinterest, Instagram, and more. Why is Spreesy Store a good Shopify alternative? If social selling is your focus, Spreesy is your answer. In Spreesy, you can enter products to sell, including items with options like size and color, and even price variations. Then you can list select items or your entire catalog to your social media accounts, where your products appear in a salable format. For Facebook, Spreesy lists items in your Facebook Shop. With Pinterest, you get Buyable Pins, and on Instagram, Spreesy creates shoppable posts. As your social followers snap up their faves, Spreesy’s secure checkout takes the sale using PayPal for the payment. You can even print shipping labels using Spreesy’s ShipStation integration. For social selling, it’s quite a tidy solution, and comes with no monthly fees. You only pay the transaction fees, listed above, when you make a sale. When you use Spreesy, you also get a standalone store. It’s a pretty basic one-page online store, but for many it does the trick. Following its social-selling roots, a Spreesy store looks very much like a Pinterest page. If that’s not enough for you, Spreesy actually integrates with Shopify, so if you ultimately decide Shopify is the right ecommerce solution for you, you can connect it to Spreesy to sell on some or all social sites. Does Spreesy sound like the right Shopify alternative for you? If so, learn more about using Spreesy here. Who is Zoey best suited for? Small to medium ecommerce sellers who want a highly customizable Shopify alternative. Monthly fee The priciest of the lot: $199 - $599/mo. Why is Zoey a good Shopify alternative? Launched in 2014, Zoey is the new kid on the block platform-wise, but it’s already answering the needs of ecommerce sellers who want to create a highly customized online experience for their users. Platforms like Shopify and BigCommerce, discussed above, do many key things very well, but they don’t offer much in the way of customization. That said, for most online sellers, standard ecommerce platforms deliver all that’s needed and plenty more. But some online store owners have specific store design requirements and feature needs that the standard platforms don’t provide. Here’s where Zoey steps in with the answer, though it comes with a price far higher than Shopify and every other solution on our list. But if total control over the look, feel, and functionality of your store, is a must-have, you’re likely happy to pay Zoey’s price. Zoey can deliver this upper-tier store experience because it’s built on the Magento platform. Magento powers some of the internet’s top ecommerce properties, and offers unmatched versatility. But it generally requires an army of developers to build and support, putting out of the reach of smaller ecommerce companies. Zoey’s developers changed all that by bringing Magento to the masses. So, if you’re looking for a Shopify alternative that’s easy to launch, but offers with virtually limitless options and scalability, Zoey should be a top contender in your list. Does Zoey sound like the right Shopify alternative for you? If so, learn more about Zoey here. If you’re shopping for Shopify alternatives, you definitely have some choices. Some, like Square’s free online store, are simple solutions that are quick to set up and easy to use. Others, like WooCommerce and Zoey provide a broad playing field upon which you can build the online store of your dreams. Still others fill a special niche, such as Ecwid’s multi-platform integrations and Spreesy’s vast social selling capabilities. Many of these options are great for certain needs. For that matter, so is Shopify. So the decision really comes down to your overall plans. Swapping a store to a new platform isn’t an easy task, so balance your sales needs now with where you think you’ll be in a year or two. For some, starting with an entry-level plan on a top platform that supports exponential growth, like BigCommerce, is the smart choice. For others, a simple, free platform like Square will meet your every need. Have you used any of these or other Shopify competitors? Please share your thoughts and experiences in the comments below. Any tips on using Square and Shopify together? You can use Square and Shopify together, but if you need to pair online sales with in-person mobile payments using your cell phone, Shopify handles all of that for you. Shopify’s mobile POS is free with any Shopify store plan and the fees are very competitive with Square (even lower, depending on your Shopify plan). Shopify also has an in-store register, checkout, and inventory management POS system that works with the online store very well. However, it’s a $49 per month added fee. 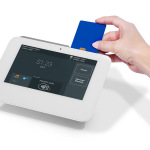 If you need an in-store register solution, Square can be a more economical solution. What are you wanting to do, in particular? Let me know and I’ll see if I can get you a more solid answer. Thanks, Krista, I really enjoyed reading your article, your article was valuable and informative. I think it is very important to know about different eCommerce platforms before deciding which one is the best, it is well known that Shopify is the best eCommerce platform, however, there are many alternatives for it. I personally recommend using the OpenCart platform, it is an opensource platform with many free plugins and a lot of unique features. I’ll check it out. I think I looked at it a while back but haven’t tested it lately. Thank you for the reminder.